This exquisite Victorian silver cased set of four salt cellars and spoons is dated London 1869 and was made by the renowned Robert Hennell, member of illustrious Hennell family of silversmiths. Each circular salt raised on a pedestal foot. The fluted sides with engraved borders. The salts interior a pale gilt colour. They come in their original leather presentation case, retailed by Elkington & Co of Liverpool and lined with a rich green velvet and cream satin. The four solid silver salt spoons are matched but are a perfect fit. Date letter "o" for 1869. Diameter: 5.5cm - 2 inches. Height: 4.5cm / 1 1/2 inches. Box in very good shiny condition. 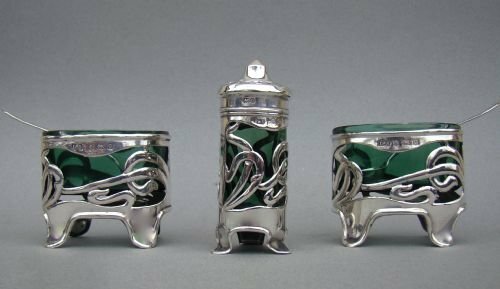 This fine pair of Mid-Victorian solid silver salts is hallmarked for London 1853 and was made by Joseph & Albert Savory, highly regarded silversmiths. Each salt having a cylindrical body pierced with geometric designs within reeded borders. Raised on four decorative cast bracket feet. Each fitted with a cranberry glass liner, always a very desirable colour. The liner with star-cut base. 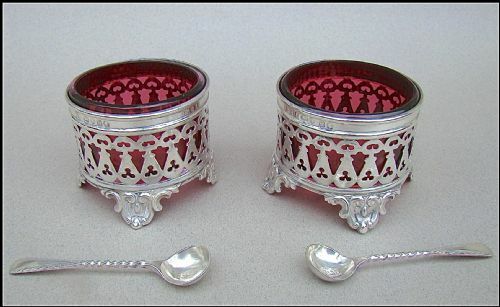 Sold with a pair of Victorian silver salts spoons by Josiah William & Co, London 1894. JS over AS for Joseph and Albert Savory. Weight excluding liner: 104 g / 1 3/4 oz. 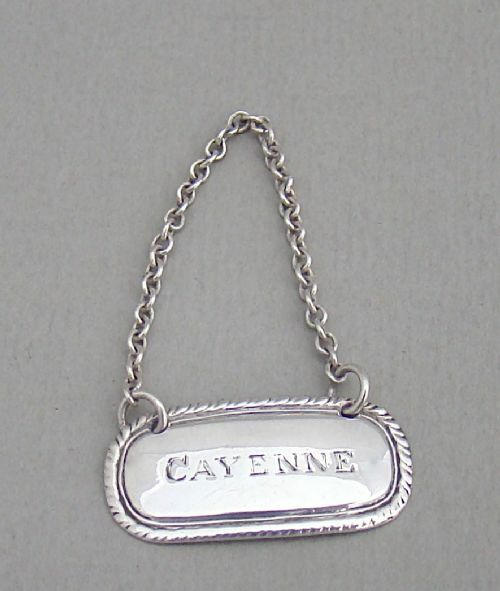 This delightful and rather rare Georgian silver "Cayenne" sauce or condiment label is hallmarked for Birmingham 1814 and bears the marks of Matthew Linwood. It is fully hallmarked, which is a bonus, as it is not often the case for such small Georgian items. It is of oval form with a fine gadroon border. 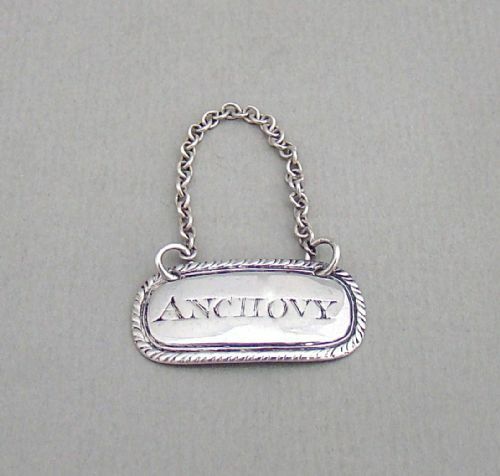 Shown on the last two images with matching "Anchovy" label. Date letter "q" for 1814. Label: 2.75cm x 1.2. cm. This delightful and rather rare Georgian silver "Anchovy" sauce or condiment label is hallmarked for Birmingham 1814 and bears the marks of Matthew Linwood. It is fully hallmarked, which is a bonus, as it is not often the case for such small Georgian items. Shown on the last two images with matching "Cayenne" label. 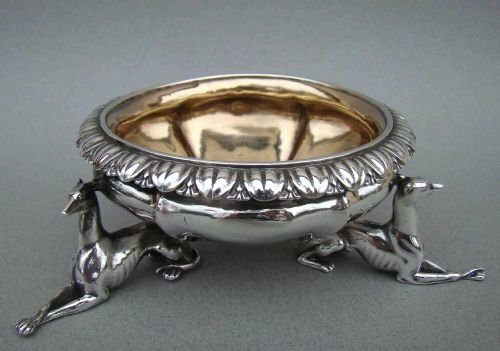 This simple and elegant silver mounted clear glass mustard pot is dated London 1898 and was made by the prolific John Grinsell & Sons. 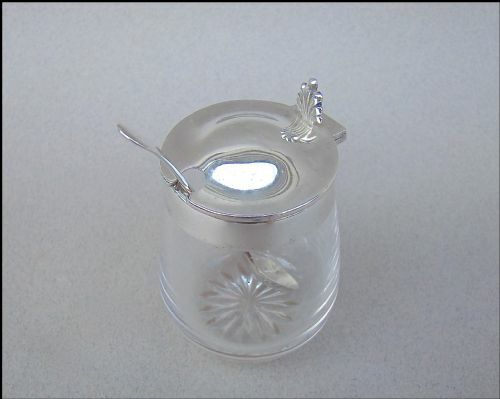 The plain oval glass body mounted with a simple silver domed hinged lid, the silver neck fully hallmarked, the lid with a pretty shell thumb piece. Sold with a solid silver mustard spoon marked Thomas Bradbury & Sons and dated Sheffield 1935. Date letter "c" for 1898. Diameter at widest: 5cm / 2 inches. 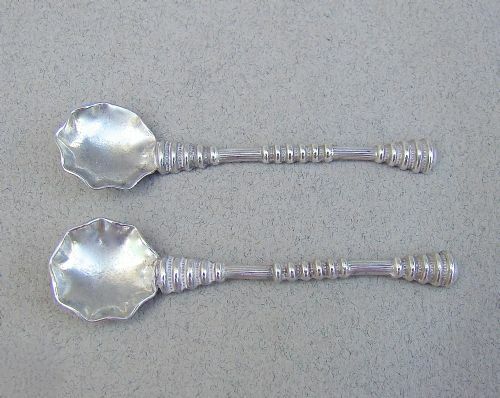 This unusual and charming pair of Victorian solid silver salt spoons were made by the prolific George Edwin Walton and are dated Birmingham 1893. Each pinched circular bowl with a flat reeded handle with concentric decorations. Date letter "t" for 1893. Length: 6.5cm / 2.4 inches. 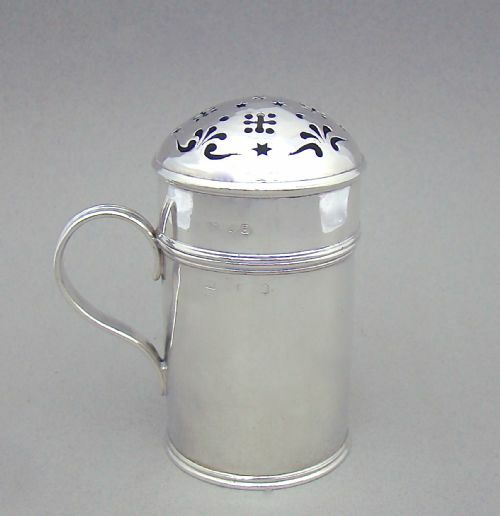 This exquisite and rare silver open salt, hallmarked Edward, Edward Jr, John & William Barnard, is dated London 1831. The sectioned circular body raised above three seated lurchers. Ovolo border and gilt interior. EJB EW for Edward, Edward Jr, John & William Barnard. Date letter "q" for 1831. Weight: 200 g / 6.5 oz. This stunning George III cruet stand is dated London 1774 and was made by Thomas Daniell, a fine maker. The circular stand with a finely pierced wavy border and a separately hallmarked central cast silver stem leading to a shaped handle. The pierced border with two delightful heart-shaped vacant reserves. Raised on three claw and ball feet. 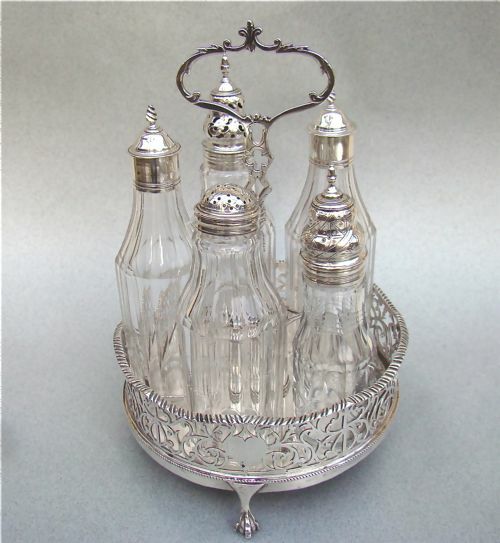 Comes with six silver mounted condiment bottles, all hallmarked, some original to the stand and marked for Thomas Daniell. Date letter "T" for 1774. Height up to handle: 21cm / 8.2 inches. Minor split near one foot, otherwise excellent condition. Postage UK: £10 Special Delivery Next day. Postage overseas: £20 International Signed For. This is a beautiful cast silver Owl salt and pepper made by the renowned silversmith Richard Comyns in 1958. Naturalistic plumage and lovely glass eyes. Pull-off covers, each pierced differently for salt and pepper. Inner cover partially hallmarked with Lion Passant and Date letter. 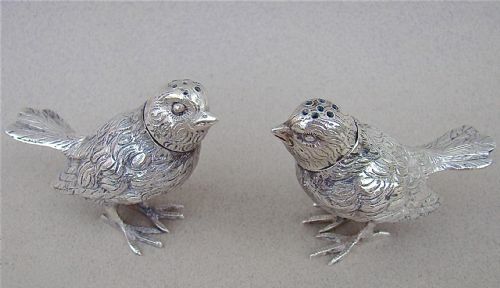 This delightful pair of German cast silver pepper shakers modelled as birds dates circa 1910. Each naturalistic cast silver body has detailed plumage. The cast feet are very detailed and serve as a base, they are delicate while being very stable. The pull-off covers open by twisting to one side and stay securely in place by twisting on the opposite side. The pull-off detachable heads hallmarked 800. Length tail to beak: 8cm / 2.6 inches. 60g / 2 1/4 oz. This is a very rare Georgian solid silver large muffineer or flour dredger. It is dated London 1820 and bears the marks of Sebastian Crespell II. It is unusually large for a silver example. It is more the size of a brass example. Of traditional cylindrical form with pierced pull-off cover. Reeded base , girdle and handle. It has a very good gauge of silver. SC for Sebastian Crespell II. Diameter: 6cm - 2 2/8 inches. Weight: 173g / 6.1 oz. No dings or dents to the body. No loss to the pierced decorations on cover. Marks a little rubbed at places but identifiable. 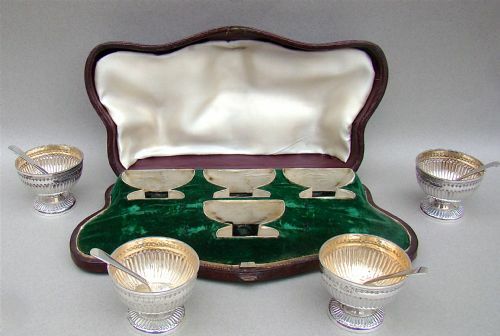 This is a rare and exquisite silver condiment set was made in Birmingham 1905 by the well know makers Levi & Salaman. Each piece pierced with sinous designs and standing on four curved bracket feet. Fitted with their original green glass liners. Complete with a pair of spoons by the same maker but a later date. Date letter "e" for 1905. Date letter "y" for 1923. No repairs, a few minor dings. All three items sit firmly on feet. On pepper the feet are slightly pushed but it does not affect the stability of the pot. Height: 7 cm / 3 inches. Length: 5 cm / 2 inches.